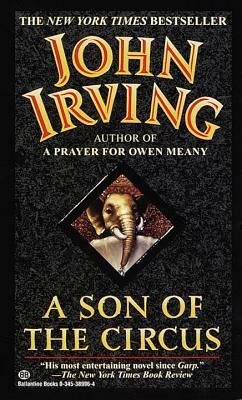 "A SON OF THE CIRCUS IS COMIC GENIUS....GET READY FOR IRVING'S MOST RAUCOUS NOVEL TO DATE." "Dr. Farrokh Daruwalla, reared in Bombay by maverick foes of tradition, educated in Vienna, married to an Austrian and long a resident of Toronto, is a 59-year-old without a country, culture or religion to call his own....The novel may not be 'about' India, but Irving's imagined India, which Daruwalla visits periodically, is a remarkable achievement--a pandemonium of servants and clubmen, dwarf clowns and transvestite whores, missionaries and movie stars. This is a land of energetic colliding egos, of modern media clashing with ancient cultures, of broken sexual boundaries." "HIS MOST DARING AND MOST VIBRANT NOVEL...The story of circus-as-India is told with gusto and delightful irreverence." "Ringmaster Irving introduces act after act, until three (or more) rings are awhirl at a lunatic pace....[He] spills characters from his imagination as agilely as improbable numbers of clowns pile out of a tiny car....His Bombay and his Indian characters are vibrant and convincing." "IRRESISTIBLE...POWERFUL...Irving's gift for dialogue shines."